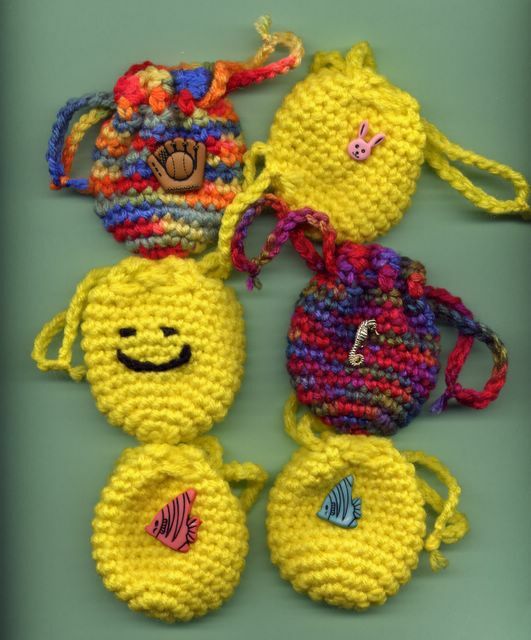 I created this cute little bag for my grandchildren to carry quarters in. Small amount of worsted weight yarn. Black yarn to make a smiley face or a cute button, charm, or whatever you like to decorate the bag. Finished size is about 2 & 3/4 inches wide by 2 & 3/4 inches tall. Rounds 5 - 12: Single crochet in each stitch around, slip stitch in next stitch to join, chain 1. Round 13 : Single crochet in same stitch as chain 1, * chain 2, single crochet in next stitch, repeat from * ending chain 2, join with slip stitch in first single crochet. Thread the first tie through all the way around, and join it to itself. Thread second tie through starting on the opposite side of the bag that you began to thread the first tie through. Join this to to itself also. When the ties pulled on each side, at the same time the bag closes.